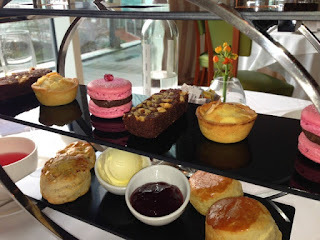 Last Monday, The Afternoon Tea Club were invited by Manchester's premier five star hotel, the Lowry, to come and sample their brand new afternoon tea menu - We were in for a treat! Furnished to a high standard and with views overlooking Manchester’s River Irwell, the Lowry Riverside Restaurant is a place of modern elegance. Minimalistic but fully equipped with comfortable leather chairs and art lined walls, this restaurant has a vibrancy which is most refreshing - particularly on a dreary Manchester day. Personal highlights included their lovely collection of pencil and ink drawings, which were clustered around the room, offering a particular talking point for both of us. The simplicity of the pieces is very reminiscent of Lowry’s own work, making it especially relevant within this particular hotel. - All in all, a lovely place to spend an afternoon! There’s a lot to be said about a tea room that not only looks special but makes you feel special and The Lowry definitely ticks both boxes. From the moment our coats were taken, to the very last drop of fusion tea, we were treated like royalty – well we do like to think of ourselves as the Queen’s of afternoon tea! Situated in the urban surroundings of Manchester's River Irwell, the stunning views on this beautiful snowy afternoon made you forget you were only a stone throw away from the busy centre of Manchester. The décor is admirably understated, with mint green and pale bronze hues but the delicate linear artwork on the walls and gorgeous floral centrepiece subtly give it an elegant dose of life. A soothing choice of music too - the perfect setting for a lovely afternoon tea. Carefully formulated and presented with absolute precision, this tea is easily one of the best in Manchester. 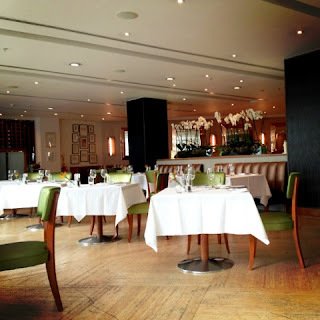 The Lowry’s desire to create a special experience is evident throughout their menu, which offers a modern twist on old traditions, steering away from the generic fruit scones and tea loaf, and opting for something a little more extravagant. For me, the particular highlight of this wonderful selection was the Apple and Cinnamon scones which were, quite frankly, a delicious revelation. When making scones myself in the past, I’ve never considered such a flavour pairing, but it really really works. They were light, airy and perfectly delicious. Similarly the Chocolate and Pomegranate Macaroons were delightfully fruity - a real treat for the taste buds. As part of the experience, we were also given the opportunity to sample a selection of the teas and coffees available. The Lowry offers a very impressive range of Jing Teas and Herbal infusions, which include: Earl Grey, Morning blend (three blends of Assam), Afternoon blend (50% Assam and 50% Darjeeling), Organic Maojian Green tea, Organic whole hamomile flowers, Blackcurrant and Hibiscus fruit infusion, and Whole Peppermint leaf infusion. Being a stickler for tradition I initially opted for the classic Earl Grey, before moving on to the Blackcurrant and Hibiscus fruit infusion. This fruit tea was one of the nicest I’ve ever had - Delightfully fruity and well balanced - and the perfect way to end the afternoon! Oh wow – where to begin? We were treated to a spectacular champagne afternoon tea which, I have to say, exceeded my expectations in every possible way. Why? Well to start, our champagne flutes arrived accompanied by a mini shrimp cocktail, beautifully presented and smothered in gorgeously creamy sauce. To accompany was a lovely fresh rhubarb meringue.Oh my - It was gorgeous and honestly, I could have left satisfied at the first dish. Yum. 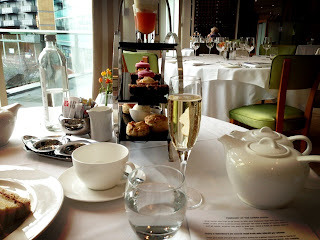 But of course, we were here for an afternoon tea treat – and what a treat it was! I applaud The Lowry for their unique presentation. A stylish tea stand, loaded with plenty of fabulous treats for us to sample. The sandwiches were wonderful. Different types of bread for every palette with a selection of egg, ham and mustard, cucumber, salmon and cheese fillings. I’ve got to say, my favourite was the ham as it was quite different to the usual choice of afternoon tea sandwiches. Next up, and possibly the part I was looking forward to the most –scones with jam and cream. But of course, as the Lowry doesn’t appear to do anything by halves, these were no ordinary fruit scones. We were spoiled with two types – classic plain and apple and cinnamon. Layered with beautifully rich jam and cream they were actually the best scones I’ve ever tasted - you can quote me! And finally, the impressive selection of miniature sweets were just amazing. Prepare yourself: you will drool ... A cute pink chocolate and raspberry macaroon, a slice of hazelnut chocolate brownie and a mini bakewell. And that’s not all – we were treated to individual real orange trifles too – I did warn you! Meanwhile, we indulged in their wonderful selection of fusion teas – my personal favourite was the blackcurrant and hibiscus – such a calming scent and deliciously fruity. All in all – impressive. I can say without hesitation that the Lowry’s service is by far the most sophisticated that we have ever received. Like everything else at this restaurant, their attention to detail is impeccable, being prompt and efficient, without losing any of their charm and enthusiasm. We were made to feel very welcome throughout our entire two hour visit, being offered everything from extra cushions, to a very informative tea demonstration. If you’re looking to be spoilt for an afternoon then this is definitely the place to go. Attentive and polite staff are all we ask for here at the ATC – but the staff at The Lowry proved what a difference that extra bit of oomph can bring to a traditional afternoon tea. We were greeted at the door bya lovely chap named Sherman who made us feel incredibly welcome and went the extra mile by guiding us through each of our courses oozing knowledge on allof the different teas and tips for a perfect brew. It’s great when staff have avisible passion for their work and all of the team at The Lowry exerted this generous spirit. The Lowry is one of those places that not only offers good food, but also creates unforgettable experiences. From the comfort of their surroundings, to the sophistication of their staff, this restaurant is a perfect ten all ‘round - So much so in fact, that we’ve had to invent a whole new level of classification, just to accommodate it - The Golden Cupcake! As much as I love a good cake, the best thing about the Lowry for me was the wonderful team. Attentive, approachable, knowledgeable and just all around lovely people. They created the atmosphere for me and managed toprovide a top class, formal setting but were happy to engage in conversationwith us, making us feel at home. 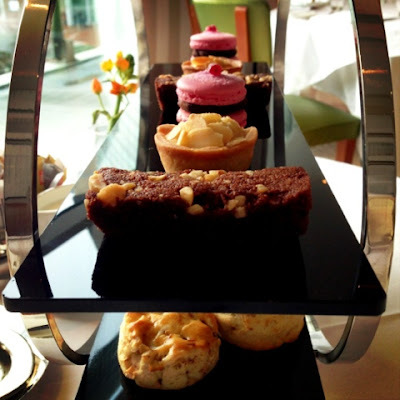 If you want utter indulgence and in search of the perfect spot for tea then look no further than the Lowry – utter class. Plus! 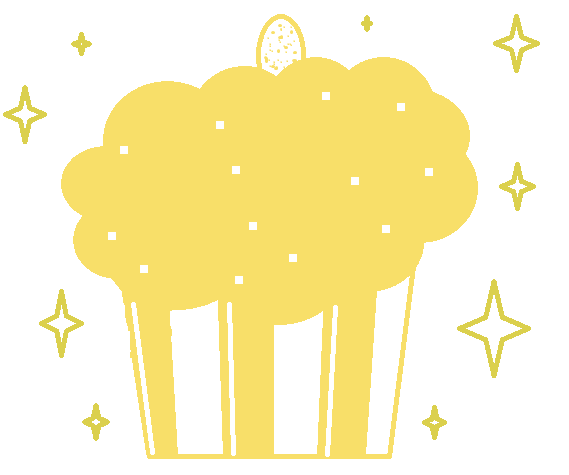 We are awarding the Lowry with The Afternoon Tea Club's extremely elusive Golden Cupcake Award - only given to those who have truly shone in the afternoon tea department. Congrats, champagne tea for everyone! Happy Birthday to The Afternoon Tea Club!